Josue Alvarado, better known as "Jaydee the Barber", has worked in the Bushwick area for over 10 years. Cutting hair is his passion. 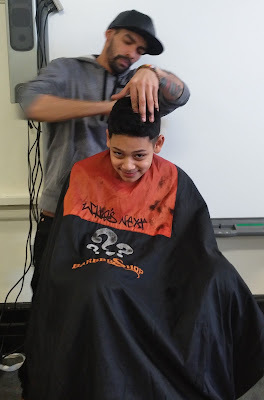 He loves to work his magic at the "Who's Next Barber Shop" located in Williamsburg. He agreed to volunteer his time once a month at P.S. 106 with our boys' club members. He agrees that boys need a strong foundation to build from when going out into the real world. What better way to do so than starting right here, the place where they spend over 6 hours a day. Thank you Josue!